Note: If used on PLUS/GX, this design allow to continue to have a logical layout without the "C" input (SPARE/FIRE3 pin 5). Some 5$ controllers shells on eBay will do the job with a new PCB... Just require to replace the USB cable by the good one! Now... 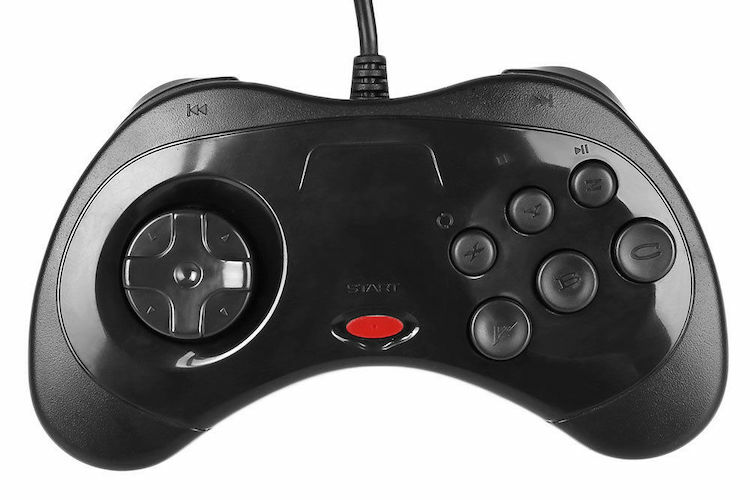 The 6 buttons MD/SAT controllers are nice for using A, B, C as standard fire and X, Y, Z as auto-fire! Thanks for the help so far folks. I've made up a schematic and drawn up my PCB to get a couple ordered. Before I do however, On my prototype board I linked the two com ports so that if a y splitter was used the controller would work as player 1 or player 2. Is this the usual way of doing things? I don't think the joystick that I have does this. 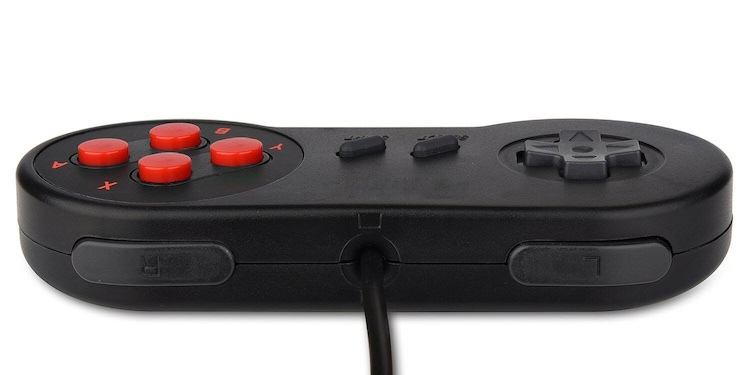 As, If you plug it in without a y splitter, it fires out the signals for both player 1 and player 2. Doesn't seem to cause any trouble when playing games though. But I've never played a simultaneous 2 player CPC game before.. Do they exist? Nevermind, I looked at how the splitters work. I'll rectify my schematic etc. Hi all, After my prototype worked fine I thought i'd make some PCB's. I got 10 of them through the post today and I soldered the switches and wires in on one of them. I will change the wires from being soldered directly to the board to some pins with connectors on the wires I think. Next thing I need to do is make a case for these babies! Not sure what way to go. I was thinking of 3d printing them, but I'm not sure how the quality would be with that.I need to put some cable relief in the case somehow so the wires don't accidentally get pulled out. Sorry for the shameless self promotion. I want to make the fire buttons a bit bigger. 10mm instead of the current 8mm. Not sure why I went with 8mm! They just don't feel so good at that size. 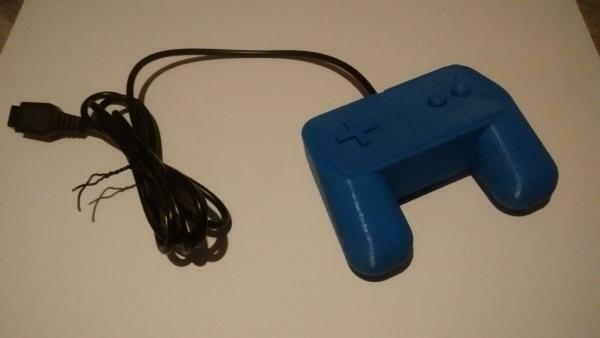 Made another controller in blue, with slightly larger buttons then had a little play the other day and thought it could be better. More ergonomic! So I made a wee surround that makes it a little better to hold. I'm printing out another one as I write. Thought you all might like a peek! It works pretty good. So when the second controller is completed (should have the last part printed by the time I get home), I'd like to have a play of 1943 with another. 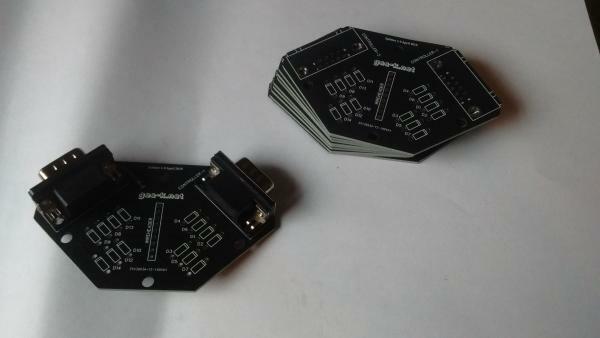 Yesterday I toke delivery of my splitter PCB's and soldered one up. I tried it out last night with some really odd results. The two controllers that I currently have both work fine when plugged straight into the 464 (as controller 1). If I use the splitter, the fire 1 (Z) works but none of the rest work correctly. If I hold the Z button down, then left works and then down and right are reversed. I'm getting nothing from either up or X. This is the same for port 2 but with the relevant port two outputs. I'm wondering if the cheap diodes I bought from China have the cathode side marked wrong and they should in fact be the opposite way around? Or if (more likely!) I've no understanding of the way the diode should go haha! I thought i'd add an image of the splitter PCB's to see if anyone can see just by looking at it what is going on..
Got my splitters working fine now. Found the issue. Was just me being a pillock! Need to design a case for it and print them out now. Page created in 0.168 seconds with 55 queries.